There’s Mirror shenanigans afoot in The Next Generation’s latest comic adventure. 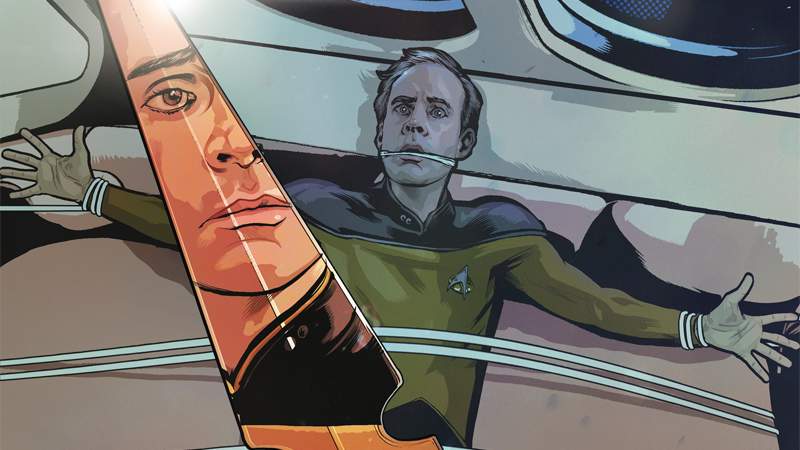 After IDW recently gave The Next Generation its first proper stint into the beloved Mirror Universe, its newest Trek comic offers a follow up that honestly, kinda sounds like it’s going a bit by the way of Star Trek: Discovery. Ahead of IDW’s WonderCon panel today, io9 can exclusively reveal Star Trek: The Next Generation—Terra Incognita, a new six-part miniseries set in the TNG era from Scott Tipton, David Tipton, and Tony Shasteen. Terra Incognita will tell a series of standalone adventures with the crew of the Enterprise, just as if they were six episodes of the show itself. But there’ll be one throughline: A mirror universe crewman from both Mirror Broken and the upcoming event series Through the Mirror has found his way into the prime timeline, and has disguised himself as his prime counterpart in order to wreak havoc aboard the Enterprise. The full main cover for Star Trek: The Next Generation—Terra Incognita #1. IDW describes Terra Incognita as a series that is “beginning a brand-new wave of episodic miniseries,” so maybe we can expect more not just from the Next Generation crew, but other beloved crews and eras from Star Trek’s long history (more DS9 and Voyager comics, please!). But for now, Picard and his friends are going have to deal with a sneaky assailant in their midst. Check out a few more variant covers for the first issue below, making their debut here on io9. Date night for Troi and Riker in this variant cover. The crew of the Enterprise is overshadowed by a Terran Empire threat in this variant cover. Star Trek: Terra Incognita #1 hits shelves in August.